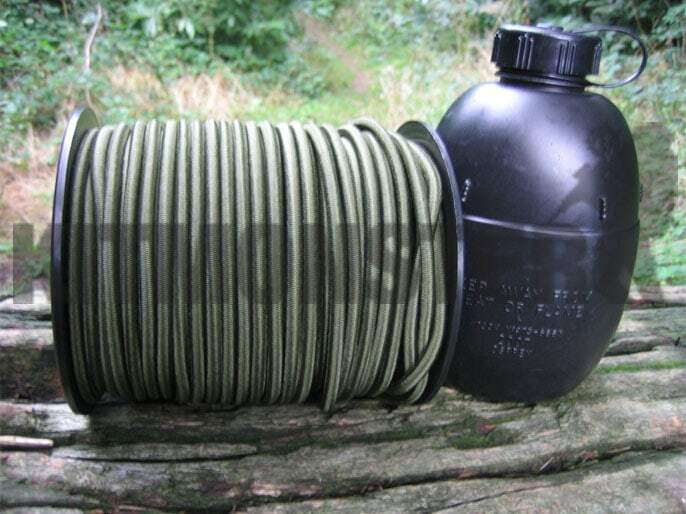 1 metre cut length of military green 'bungee' cord. 8mm diameter OG shock cord cut from the reel. Multiple uses, fitted around the outside of belt kit, used for attaching foliage and scrim for camouflage, vehicle canopies and whatever else you'd like to use it for. Cut to order in continuous lengths, if you order 5 units you will receive a single 5 metre length. Photograph shows the cord on the reel, cut length supplied. Waterbottle for scale, this is not included. This item is cut to order and is therefore considered as 'made to order' and as such it may not be returned.